“Reorder Reminder” in BMO Online Inventory Management System is used to remind your company staff when quantity of on hand item is less than the minimum quantity of “reorder level”. 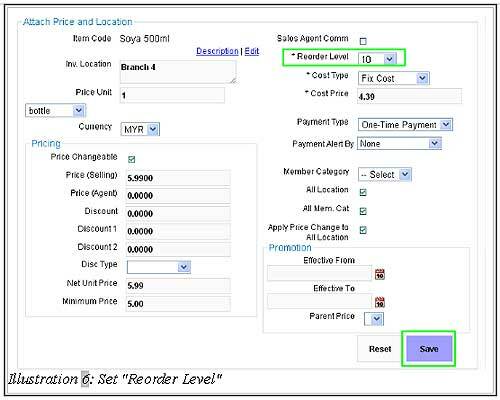 User can set the reorder level when creating item price or editing the item price. Besides that, you can set the reorder alert in your “Dashboard”. 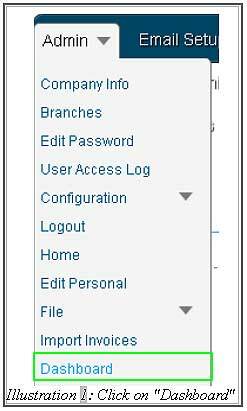 This means, when you login into BMO Online system, the reorder widget will display the items which needs reorder and on hand quantity at the Homepage. 1. Click on “Dashboard” (Admin > Dashboard) on the navigation menu bar. 2. Select and check the “Reorder Level” box. Click on “Save” to save and submit the Dashboard Widget setting. 3. A notification will pop up to notify you that dashboard widget of “Reorder Level” has been customised successfully. 4. After that, click on “Home” at the top left of the navigation path to show the dashboard widget. 5. A “Stock Reorder Reminder” list will be displayed on the “Home” page to remind customer to receive item or request stock from other branch. S.O. Pending Quantity of item that already made Sales Order but have not delivery yet. On Hand Current quantity in the inventory. P.O. Pending Quantity of item that already make purchase but have not delivery yet. 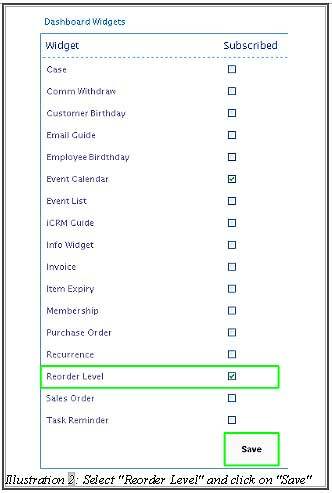 Reorder Level Reorder reminder level that set by user. 1. After creating a new item, user can set the reorder level when creating the item price. For example, if user set “10” on the reorder level, this means that the item will be shown on reorder reminder list to remind user to add stock if the item quantity is less than “10”. 2. Click on “Save” to save the setting. 3. A notification will pop up to remind user that the new item location and price are attached successfully. 4. After that, click on “Home” at the top left of the navigation menu to see the “Stock Reorder Reminder” widget at the dashboard. Item “Soya 500ml” is listed in the Reorder Reminder List because the on-hand quantity is less than the reorder level.